NEW Design Tire Gauge - Great looking new graphics, now reads in 1/2 lb. increments and includes both angle and ball chucks. ALL liquid filled gauges are purposely filled to just 80%. The remaining 20% air pocket helps allow for thermal expansion and contraction as ambient temperature changes, thereby maintaining accuracy. If the gauge were filled to 100% even the slightest temperature change would significantly affect gauge readings as the expanding fluid would have no place to go. To give you even further accuracy over a wide operating range these Longacre gauges have a Special Vent Valve on the top of the gauge. A quick turn of the knob allows you to totally equalize internal and external pressures, guaranteeing the best accuracy possible. All pressure gauges - liquid filled and regular - need to be vented to the outside to read accurately. If not vented, as the surrounding temperature changes, they will build up pressure inside and affect the accuracy - by as much as 2-3 psi! 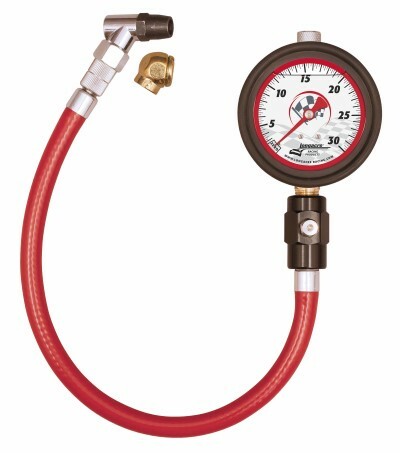 But if a liquid filled gauge is vented it will leak on your hands and in your tool box. Some manufacturers aren't aware of this and don't vent the gauge. You then have to deal with the variation in accuracy. Now from Longacre comes the simple answer to this problem. We have installed a specially designed pressure equalizer valve on the top of the gauge. Before you use the gauge just loosen the knob on top of the gauge 1/4 turn, then hand retighten. Instantly any temperature-caused pressure difference will be eliminated and you will be guaranteed the most accurate readings possible. If you have a liquid filled tire gauge prove it to yourself. Take your gauge that has been in a cool place and in the typical range you use. Then take the gauge and put it out in the sun for about 45 minutes, as would happen during a race. Then re-check the tire that is still in the cool place. You will see that the reading has changed. You know that the pressure in the tire is the same so the gauge reading must now be off. How will this affect your handling to have tire pressures high or low by several psi? What's worse is that you don't know at what temp the gauge is actually correct! It depends on the temp in the factory when it was manufactured. You could remove the rubber fill plug on the gauge. But then the liquid would leak out.